While combing my shelves for something interesting to share with y’all last night I came across three CDs I’ve somehow not yet posted by the utterly sublime Saigon chanteuse Thanh Thúy. 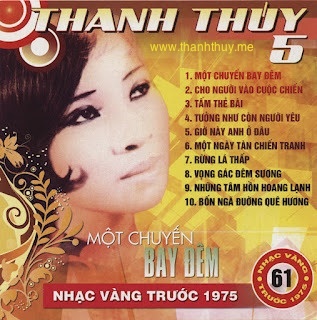 Featuring recordings from before 1975, the Nhac Vang Thuc Hien Truoc 1975 series provides thousands of Vietnamese immigrants with hours of nostalgic memories–and the rest of us with a window onto a now-long-lost world. 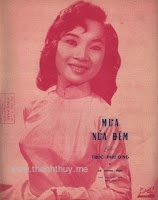 Born Nguyễn Thị Thanh Thúy in 1943 in Huế, Vietnam, Thanh Thúy began her singing career in 1959 at the age of 16. The next year her mother died and she took responsibility over her younger sisters while simultaneously becoming a national superstar–she was voted the most popular singer in south Vietnam for three consecutive years in the early 60s. This gem was recommended to me by a woman whose family owns a fairly large Vietnamese media store right on the northern edge of Montreal’s Chinatown. While there for a work-related conference several years ago I made a point, each day after the conference events had ended, of walking through Chinatown and stopping in to this place, where each time the same woman greeted me, making suggestions, including this CD. 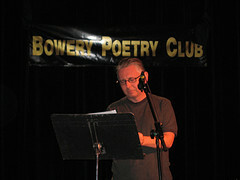 If I remember right, she said Thanh Thúy’s voice was smoky and bluesy, and that I would most certainly like it. If you do like it, let me know, and I’ll probably post the other two I have by her. I agree with you. She has an unique and rare voice. Love her voice since I was 9 years old in Hong Kong Camp.